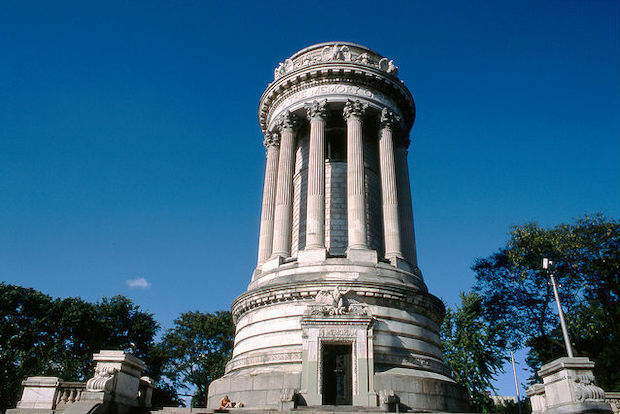 UPPER WEST SIDE — A group of preservationists and the Riverside Park Conservancy are seeking a $5.5 million renovation to the Soldiers' and Sailors' Monument, a 112-year-old structure that had its last update more than a half-century ago. The 100-foot-tall memorial to the Union soldiers of the Civil War, which sits at Riverside Drive and West 89th Street, has fallen into disrepair since its last $1 million update in 1960, said Dee Rieber, treasurer of the volunteer Soldiers' and Sailors' Memorial Association. "This is our monument. It’s in our backyard, and we really need to take care of it better," said Rieber, who said she became interested in the monument due to the early years she spent serving in the Army. The monument — a cylindrical building with 12 Corinthian columns designed in the Greek Revival style — has significantly deteriorated because of exposure to the elements, said John Herrold, the administrator of Riverside Park for the Parks Department and president of the nonprofit conservancy. "We want to halt the deterioration and we want to restore it. It’s a beautiful monument," he said. A note on the Parks Department's website says the monument is awaiting funding "to repair loosened joints, chipped stone, and the damage generally wrought by time if not vandalism." And the time is right for the city to commit to the long-overdue project, Herrold said. "Attention wasn’t being given to the cause that it memorializes...[Now] people are more aware of the sacrifices that service members make," he explained. The conservancy puts the rough estimate for the cost of the work needed at $5.5 million, including an initial survey of the scope of the damage, as well as restoration of the exterior and interior and the surrounding plaza, Herrold said. A request of $1.5 million for the surveying work and initial restoration is on the Parks Department's list of budget priorities this year, he said. The association is hoping to get support from both Upper West Side City Councilwoman Helen Rosenthal and others, Rieber said. Stephanie Buhle, director of communications for Rosenthal, said that her office had not received any funding requests for the monument, but that "Helen would be willing to support renovations, depending on what they are." The association is hoping a restoration would open up access to the monument even more, with visitors able to explore the rotunda, which hasn't been open for decades. In recent years there's been a Memorial Day service each year at the landmarked monument, but the association's own fundraising campaign aims to bring a greater level of awareness and interest to the memorial, Rieber explained. "It’s a piece of our history," she said. "This is our way of staying thanks to all of the soldiers in the city." Herrold said he's optimistic about the project's funding prospects.